On this date in our family history . . . the 3rd day of May . 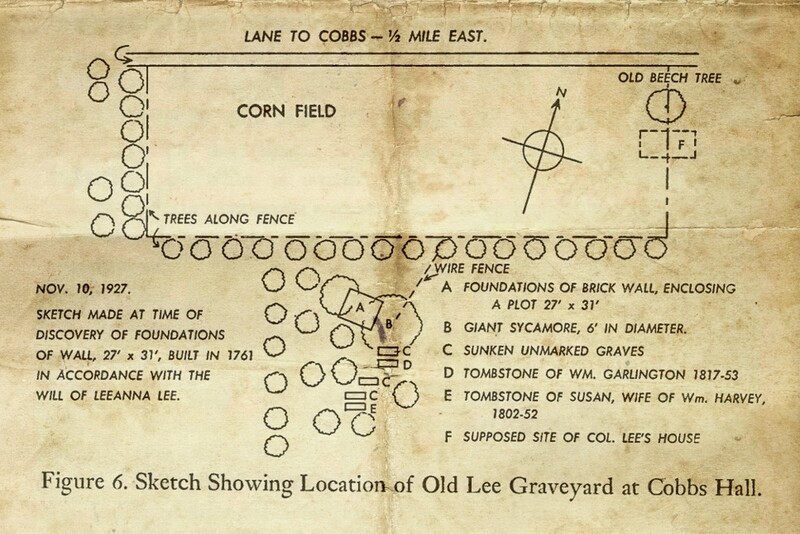 . . in the year 1958 . . . there is a gathering of the Society of Lees at the recently restored Old Lee Graveyard at Cobbs Hall in Northumberland County, Virginia . . . the people attending are our kith 'n kin . . . the people said to be buried here include various ancestors of the Keeper of this family history blog . . . in 1927 Caz Lee had sketched the following image showing the location of said burying ground . . .
From the October 2013 Newsletter of the Society comes the following . . .
"Who is actually buried at the Cobbs Hall Burying Ground? For the answer to that question we need to go back to Cazenove Lee’s 1927 Article in the Magazine of the Society of the Lees of Virginia. With only one surviving tombstone, the identification of the burials is necessarily based on analysis of existing documents, and the memory of family members. Caz works through all this information in his article and comes up with a list of Family members buried there (see listing at findagrave) . . . Was Cazenove Lee right in his analysis? Who is to say that he is not? Certainly there has been no evidence to dispute his conclusions, and it remains the best judgment we have to this day. Caz was a consummate historian and genealogist, who meticulously gathered Family information from all over. He maintained excellent records, and today, we are the inheritors of his dedicated work."